Proudly serving Farmington and surrounding areas for over 60 years, Family Chiropractic Center is known for delivering quality generational care. Since its beginning, our practice has been dedicated to compassionate, individualized service that changes lives for the better. Our community is made up of a variety of ages and experiences. Infants, young professionals, student athletes, parents, middle-aged adults, and the elderly population alike have benefited from our upstanding chiropractic care. We want to get you better and keep you better, no matter what we have to help you do to reach your healthiest destination. Dr. Annie created a practice that she would go to – which means that Family Chiropractic Center aims to fit into patients’ busy lives. 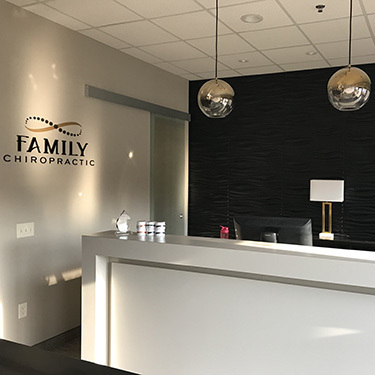 With quick treatment times, easy scheduling, upfront financials and an inviting culture, you’re sure to see why Family Chiropractic Center is beloved by the Farmington community! By understanding that each patient is unique, our doctors strive to create customized treatment plans utilizing a variety of techniques and technologies including INSiGHT™ Neurologic Scans, Diversified and Activator Method techniques, craniosacral therapy, nutrition counseling, x-ray analysis and patient education. The care plans that are given to each patient are designed to not only get patients better, but to keep them better. As an EPIC practice, Dr. Annie had the honor of assisting families and individuals on their journey to wellness. We recently treated a young child who suffered from a traumatic birth. Unsteady breathing patterns resulting in several occasions of resuscitation led her mother to us. Family Chiropractic Center was able to provide a strategic adjustment that immediately restored the infant’s breathing and range of motion. The same little girl recently turned one year old. Now is your time to regain lost hope, join our practice, and live life to the fullest. If you are tired of living in discomfort, you have come to the right place. Your body deserves the best care, and you deserve to live in it happily and comfortably. Through several manual adjustment techniques, Laser Therapy and the latest INSiGHT™ technology, our doctors and the Family Chiropractic Center staff are ready to help you live a life you are proud to call yours. We want to see you thrive, and our mission is to GET you better and KEEP you better. Contact us today to schedule an appointment!